How Do Geese Mate and Reproduce? 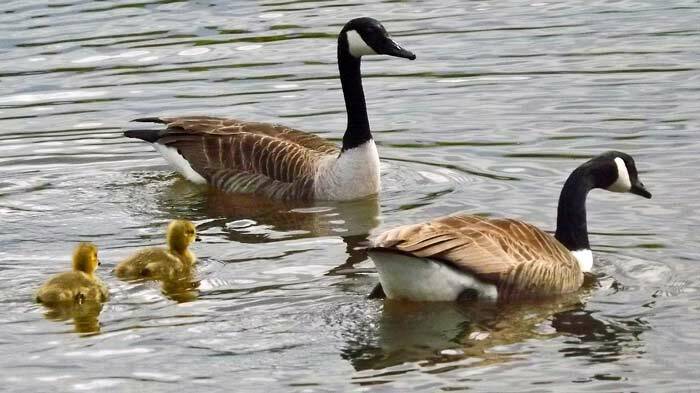 Geese reproduce by copulating, nesting and incubating, where the female builds the nest and sits on the eggs while the male remains close by to protect the nest. The incubation process typically takes 25 to 30 days. Geese typically mate for life, and after the mating process and copulation, the female builds a nest of goose down, leaves and grass. The nest is typically about 1 1/2 feet in diameter, is slightly elevated and is located near the water. Females typically lay around two to eight eggs per clutch. The hatchlings are able to leave the nest 1 to 2 days after hatching, and they are usually able to swim, walk and feed at this time.